London, England – Sunday, 1st February 2015 - On Friday evening, at the York hall in Bethnal Green, London, Nazeing, Essex’s George Hillyard put in a sensational performance to beat Czech Republic’s Michal Vosyka, to secure the World Boxing Union (WBU) International Super Middleweight title. Vosyka started fast, working off his strong left hand jab the Czech stylishly dominated the early part of the first round, easily keeping the big punching Hillyard at a safe distance. Hillyard, seemed content to bide his time as the much taller Vosyka danced around flicking his jab at the Essex lad each time he made any move to close the distance between them. Although he had managed to land a few shots, it wasn’t until around the second minute mark Hillyard managed to really break through and land one of his trademark rock solid right hand shots, which clearly shook Vosyka to the core. Hillyard reacted incredibly quickly to capitalize on Vosyka’s disorientated state, letting rip with another double handed assault to send the Czech to the canvas. In the second round Vosyka once again boxed beautifully, but little more cautiously, his creative boxing style was clearly frustrating Hillyard, who again was made to play the waiting game, just taking any opportunity that opened up to let rip. More of the same in the third, but as in the first Vosyka made the fatal error of giving Hillyard an opening, which the Essex boy capitalized on in an instant, letting rip first with a big right and then a double handed barrage to send an off balance Vosyka to the canvas for the second time. Coming out in the fourth Vosyka was way more cautious, which provided Hillyard even more opportunities to punish him, which he did in a big way after about thirty seconds or so. Hillyard backed Vosyka to the ropes and just let rip with massive lefts and rights to both body and head before letting rip with a wicked bone crushing left to the body, no surprise Vosyka elected to take a knee, in order to gather a break from the never ending onslaught. As referee Mickey Vann ended the mandatory eight count Hillyard shot across the ring and let rip with an almighty right hand, which sent Vosyka off balance and heading back to the canvas, Hillyard was taking no chances and followed in with an even heavier right to the side of the Czech’s head. Mickey Vann was straight to the prone Czech and in seconds so were Dr Rashid and his medical team. After about a minute or so Vosyka was helped to a stool and a relieved York Hall crowd showed their appreciation with a round of applause. 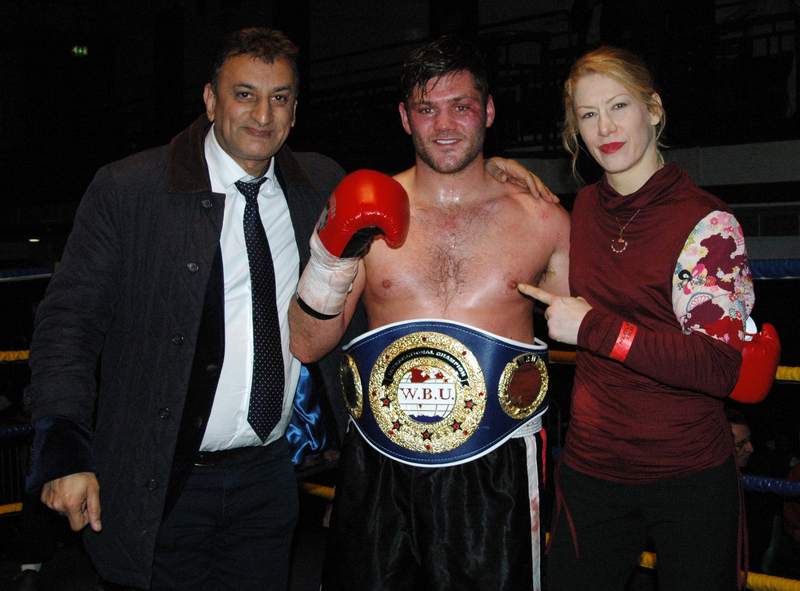 After which they were even more vocal, when MC Steve Holdsworth made the official victory announcement, before World Boxing Union Ambassador and current MBC International Super Bantamweight Champion, Marianne Marston, presented Hillyard with the well earned spoils of victory, the WBU International Championship belt. Following the bout the clearly overjoyed new Champion spoke briefly about the fight. “I’m over the moon, really over the moon. I’ve got just what I wanted, the WBU title, I’ve worked really hard to make sure I was ready for this fight, spent twelve weeks away from my family over Christmas and the New Year, now I can say it was worth it, it all paid off and I have the belt. Personally from my point of view I didn’t really fight the way I know I can, respect to Michal (Vosyka) he bought the fight to me, really messed up my A Game Play. When I hurt him in the first round, all I could do was look for that big shot all the time, yeah it worked out OK, but I feel I could have boxed him better. Yeah, but now I’ve got the title, it doesn’t matter, this is what I wanted. Word is my next fight is already lined up, word is if I win, which I have, my first defense will be against Michael Zerafa in Australia. Obviously it’s not signed and sealed yet, as everything has to be agreed behind closed doors this week, soon as that’s all done, if it’s the right money yeah I’ll be going to Australia to fight Michael Zerafa. I can’t thank the fans enough for their fantastic support, please keep supporting me as we move on to bigger and better things. This WBU title has given me a right good kick up the backside, I promise I will be more than ready for my next fight too, I’m leaving nothing to chance, I’m back in the gym first thing Monday, no messing about, this is my belt and I aint going to let anyone take it from me. I can’t thank the Malta Boxing Commission and the World Boxing Union enough, for giving me this opportunity to fulfill my dream of becoming a Champion.